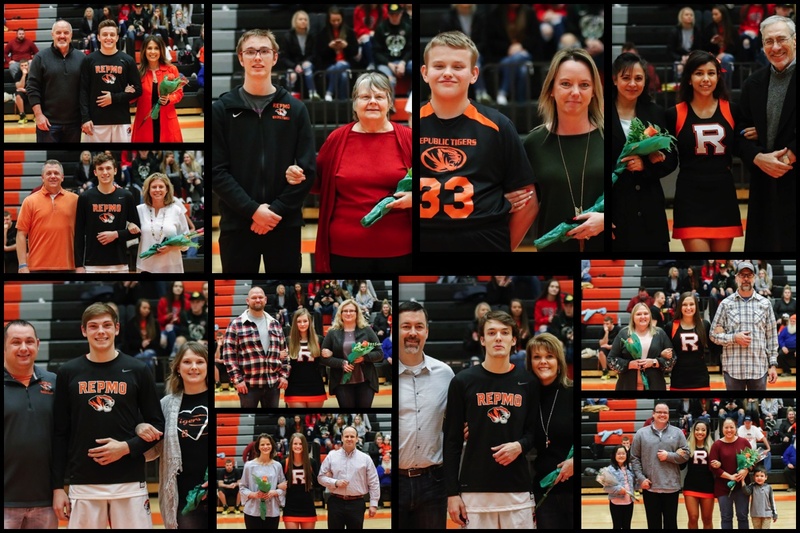 Republic honored eleven seniors during pre-game festivities Tuesday. Jacqueline Cancino was escorted by her parents, Carlos and Elvia Deschiave. 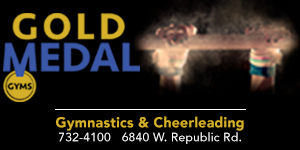 Jacqueline has cheered for Republic for one year and is a member of the World Cultures Club. She has a 3.5 GPA and plans to join the Air Force after graduation. Allison Gill was escorted by her parents, John and Tammy Gill. Allison has cheered for Republic for four years and is a member of the A+ Program, National Honor Society, and the Photography Club. She has a 3.7 GPA and plans to attend Oklahoma Christian University and study elementary education. Faith Page was escorted by her parents, Sheridan and Elizabeth Page. Faith has cheered for Republic for one year and is a member of DECA. She plans to attend Ozarks Technical Community College and study social work. Jaydra Phouthone-Samms was escorted by her parents, Jeff and Cathy Ussery. Jaydra has cheered for Republic for four years and is a member of DECA, Athletic Leadership Council, and the A+ Program. She has a 4.0 GPA and is undecided where she will attend college, but she plans to study marketing. Brooke Wieder was escorted by her parents, James and Brenda Wieder. Brooke has cheered for Republic for four years and is a member of the A+ Program, National Honor Society, and Future Business Leaders of America. She has a 4.2 GPA and plans to attend Drury University and study accounting and cyber security. Trent Rackley was escorted by his parents, Steve and Jenny Rackley. Trent is a guard and has played basketball at Republic for four years. He is a member of the A+ Program, Republic’s football team, and has a 3.5 GPA. Trent plans to attend Missouri University and study business. Cole Buxton was escorted by his parents, Richard and Ranae Buxton. Cole is a guard and has played basketball at Republic for four years. He is a member of DECA and has a 3.3 GPA. Cole plans to attend Missouri State University and study business. Jaden Duvall was escorted by his parents, David and Melissa Duvall. Jaden is a point guard and has played basketball at Republic for four years. He is a member of the A+ program, as well as Republic’s football and baseball teams. Jaden has a 3.8 GPA and he plans to attend Missouri State University and study business management. Broc Smith was escorted by his parents, Wes and Jennifer Smith. Broc is a forward and has played basketball at Republic for four years. He is a member of the A+ Program and has a 3.9 GPA. Broc plans to attend Drury University and study pre-med. Ashton Mitchell was escorted by his mother, Angela Mitchell. Ashton has been a team manager for three years and was a wide receiver and running back for Republic’s Varsity football team this school year. In his free time, Ashton enjoys playing video games and playing basketball with friends. Ashton is undecided where he will attend college, but he plans to study law enforcement. Dustin Schwind was escorted by his mother, Cheryl Schwind. Dustin is a forward and has played basketball for the Republic’s Special Olympics Team for eight years. In his spare time, he enjoys playing video games, hanging out with friends, and playing sports. Dustin has a 3.8 GPA plans to attend Ozarks Technical Community College after he graduates high school.